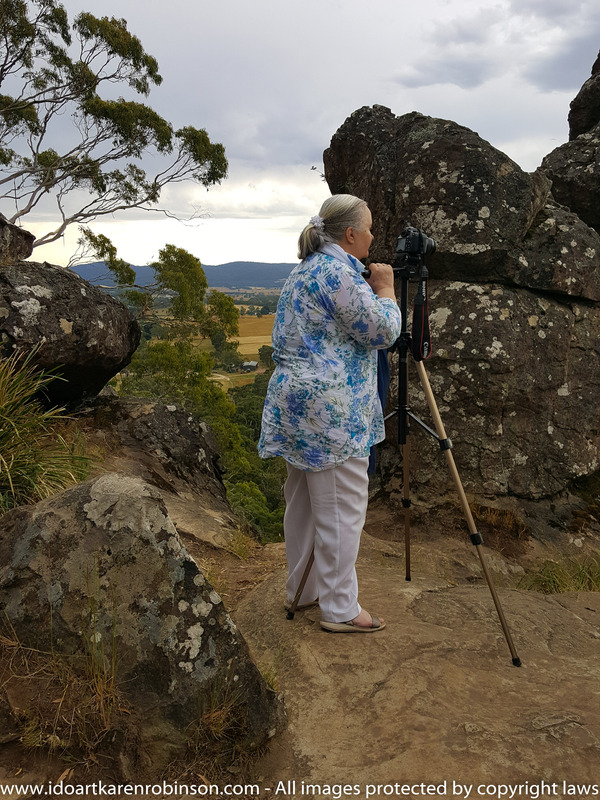 Karen took photos around and on Hanging Rock, Newham, Victoria – Australia. Accompanied by her husband on the day. Wonderful rock formations, natural Australian bush, native wildlife and expansive scenic views from the top of Hanging Rock itself. NB: Karen’s husband took this photo of her using a Samsung Galaxy S6 Mobile Phone – January 2017. This was my first serious landscape photography adventure! My dear husband came with me to help with lugging some of the equipment, to assist with the driving, and to keep me company. He’s good company my hubby. 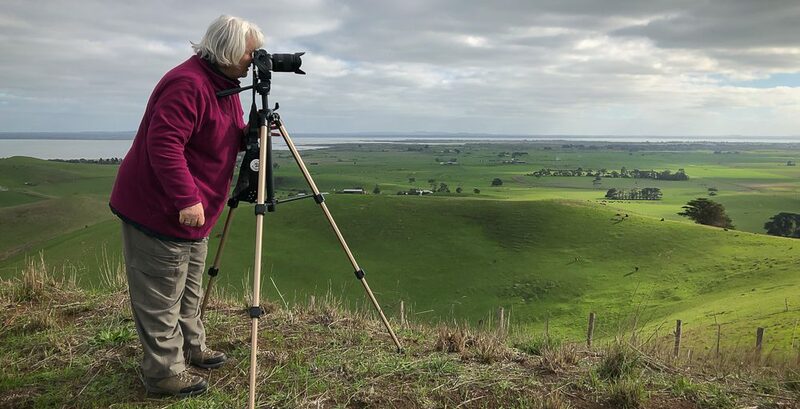 It was an early morning start, as all I had read and watched about Landscape Photography on YouTube videos, indicated that to get the best photos with the best lighting, a photographer needed to be on location for the ‘golden hours’. This being an hour before sunrise and/or one hour after sunset. So we were up at 4am to be on location by 5.30am. Armed with little ‘manual mode’ camera operational experience and lots of enthusiasm – we managed to visit two locations. These locations were just outside of Melbourne (Victoria, Australia), and just a little over an hours travelling time from home which was perfect. The first being Malmsbury ‘Viaduct’ and ‘Botanical Gardens’, and the second being ‘Hanging Rock’ at Newham. ‘Hanging Rock’ provided to be an amazing location and I managed to take some lovely landscape photographs. I used my EOS 1100D Canon DSLR camera on a tripod with a remote timer for the big shots. I also used my Samsung Galaxy S6 Mobile Phone for quick spontaneous photographs and one short video. 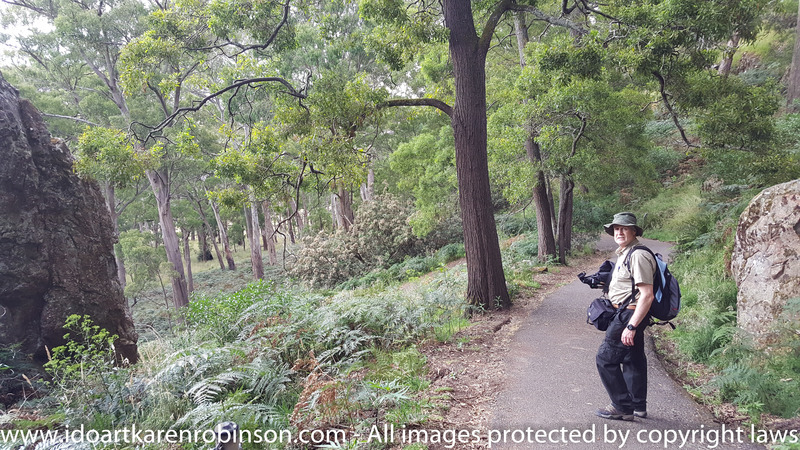 Karen’s husband walking down the path leading back to the base of ‘Hanging Rock’, Newham, Victoria – Australia. Wonderful rock formations, natural Australian bush, native life and expansive scenic views from the top of Hanging Rock itself. Photo taken with Karen’s Samsung Galaxy S6 Mobile Phone. NB: Please click on image to view in full. All images are protected by copyright laws. We spotted a ‘Black Swamp Wallaby’ on our way back down from the top of ‘Hanging Rock’ and I used the video mode on my mobile phone to quickly capture its presence before it saw us and hopped away back into the bush. My husband and I were joking around and talking to one another while I was taking the video, so you can hear us talking – note to self “don’t talk while doing a video”! On my return home, I downloaded all the photographs into Adobe Lightroom 6. This too was a new experience for me using Lightroom. It required a lot of patience on my behalf and time, in order to gain some ability to develop a small selection of photographs. Please find below the best of what I took on the day. Hopefully over time and with much more practice using the ‘manual mode’ on my camera, I will be able to take and develop photographs of a higher standard. Karen took photos near the Malmsbury Viaduct viewed from the Malmsbury Botanical Gardens. Accompanied by her husband on the day. Early morning set up! Karen took photos around the Malmsbury Botanical Gardens. Accompanied by her husband on the day. Spotted wonderful, noisy Long-billed Corella in the surrounding trees. Large and hungry, people friendly Geese swarmed us on our arrival near the lake. We had such a lovely day together my husband and I. Immersing ourselves into the Australian bush and re-experiencing nature’s beauty and peacefulness was great pleasure. And then having had the opportunity to take photographs, just seemed to be a bonus. 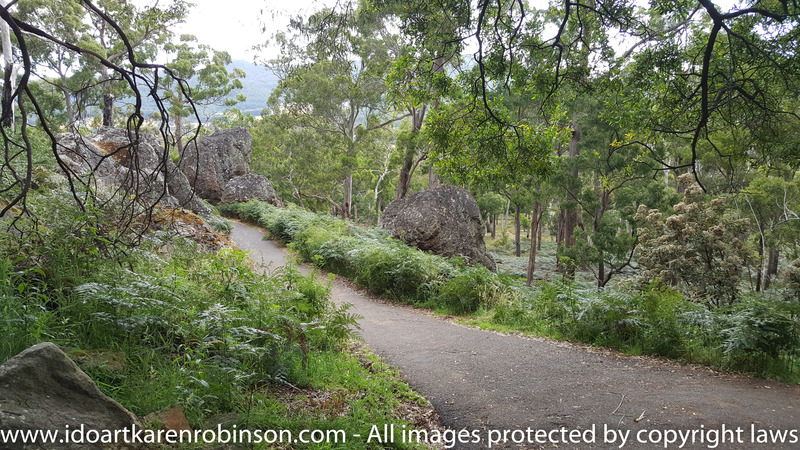 Photograph taken by Karen Robinson with Samsung Galaxy S6 Mobile Phone of pathway leading back down from the top of Hanging Rock, Newham, Victoria – Australia. Wonderful rock formations, natural Australian bush, native wildlife and expansive scenic views from the top of Hanging Rock itself. NB: Please click on the image to view in full. All images are protected by copyright laws. This entry was posted in Photography and tagged Adobe Lightroom 6, Australian Bush, Black Swamp Wallaby, EOS 1100D Canon DSLR Camera, Hanging Rock, idoartkarenrobinson, Karen Robinson, Landscape Photography, Long-billed Corella, Malmsbury Botanical Gardens, Malmsbury Viaduct, Photo Journalling, Photography, Samsung Galaxy S6 Mobile Phone by idoartkarenrobinson. Bookmark the permalink.